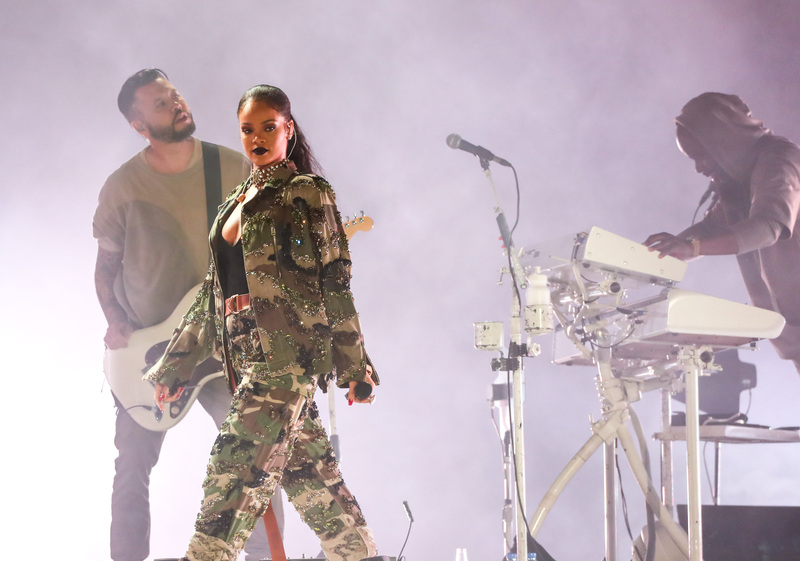 Rihanna closed her ‘ANTI World Tour’ with an energetic show at the du Arena last night, as part of the F1 after-race concert series in Abu Dhabi. The Barbadian singer, bathed in white light, kicked off the night with the sweet ballad Stay, which instantly had the crowd singing along. She appeared on a glamorous white-lit stage in a dazzling outfit flanked by dancers, before taking the audience from high to even higher as she belted out favourite early chart toppers “Umbrella”, “We Found Love” and “Work”. Posted by An.J / Filed under: Anti World Tour, News / Leave a comment? Rihanna took the V Festival stage for the second night in thigh high boots and an oversized jacket on Sunday (Aug 21st). Not only did she rock a new outfit, but also showed off new curly locks. Check out photos in our gallery. Posted by An.J / Filed under: Anti World Tour, News, Performances / Leave a comment? Rihanna wowed the crowds as she closed the opening day of the V Festival in Staffordshire last night (August 20th). The pop princess took to the stage in long culottes, one leg of which was open, and a brown leather lave-up corset. She teamed the unusual outfit with white heeled boots, a choker and bracelets and left her hair straight with dark brown lipstick. Tonight she’s taking the V Festival stage for the second day in a row. Posted by An.J / Filed under: Anti World Tour, Appearances, News, Performances / Leave a comment? Rihanna recently performed her last non-festival ANTI World Tour show in Berlin, Germany. While staying in the city, she took time to visit the huge artwork of herself, created by Juan Sebastián Peláez. The original picture of Rihanna dates back to a holiday shot taken in Barbados in 2013 that Peláez has blown up, cut the head off, and placed a generic face onto the chest. The oversized cut-out has been on show at the Kunst-Werke Institute for Contemporary Art since June 4. Check out photos of Rihanna spotted out in Berlin on Wednesday (August 17th) in our candids gallery. Posted by An.J / Filed under: Anti World Tour, Candids / Leave a comment?